Cardigan Fit: Semi-Fitted: Designed for 3 to 4 inches of ease between body and garment. Measures 3" - 4" larger than the fit-critical body measurement. Somewhat close to the body, but cut for ease of movement and fabric drape. 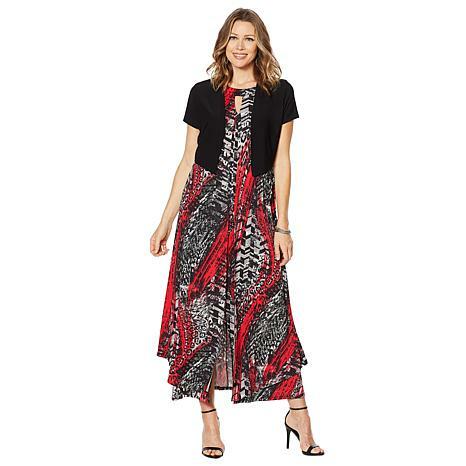 Dress Fit: Loose-Fitting: Designed for 4 to 6 inches of ease between body and garment. Measures 4" - 6" larger than the fit-critical body measurement. Generously sized for ease of movement and fabric drape. I received my dress the other day haven't had the chance to wear it yet and can't wait. It is gorgeous just hanging up so I can imagine what I will look like when I wear it. Antthony never disappoints me. As I always say keep making the hits and I will keep buying! God Bless you my friend:) I hope to meet you someday that is my prayer! Love the dress. Nice material, no wringling. Also good to have a jacket.Great length. I am 5'2 and wanted this kind of style dress last year when antthony had them. But he did not make petite size. I got a pxl i could have got a pL and would of been fine. Also thank god for the cover top. I do not like showing my arms. I bought two of them I would have bought all three but the rose gold was sold out. I will be looking for that one please bring more in stock pxl. Sculpt your style into a wearable work-of-art. This special-occasion dress features a sprinkling of sparkle in the stretch glitter knit fabrication that perfectly compliments your favorite Heidi Daus jewels. With a figure-flattering blouson silhouette, you're a walking fashion masterpiece. Sculpt your style into a wearable work-of-art. This dolman-sleeve dress features an easy jersey knit fabrication and boat neck that perfectly compliments your favorite Heidi Daus jewels. With a figure-flattering blouson silhouette, you're a walking fashion masterpiece.